- Publisher When an emergency erupts, help is as close as dialing 911 on your phone. But what can you do about your personal problems and spiritual troubles? Now you can look them up in this handbook! You'll find clear, sound, biblical advice to help you overcome 24 of the most common struggles that Christians face. When an emergency erupts, help is as close as dialing 911 on your phone. But what can you do about your personal problems and spiritual troubles? Now you can look them up in this handbook! You'll find clear, sound, biblical advice to help you overcome 24 of the most common struggles that Christians face. 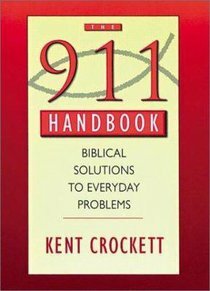 Kent Crockett is the author of the bestselling The 911 Handbook. He is agraduate of Texas A&M University and Southwestern Baptist Theological Seminary, and is the senior pastor of Cornerstone Church in Garden City, Kansas, where he lives with his wife, Cindy. They have two children, Hannah and Scott.